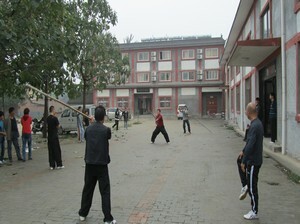 Chen Bing's School, Chen Jia Gou - The China Taichi Guide is a Directory of Tai Chi Schools & Tai Chi Teachers in China. 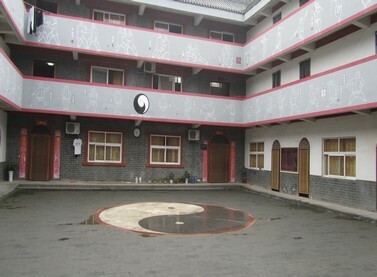 I was able to visit Chen Bing's school in 2011 and was very impressed with it. It was clear that Chen Bing is very familiar with Western students and their needs. The buildings are new and have recently been massively extended with large indoor training areas as well as outdoor ones. Fees including accommodation and food worked out at about 600 Euros for a month whatever you study and this rate continued for three months. This covers training on the entire range of Chen Style taichi so you can request whatever you want from your teachers. The training fee for students studying for a year wasn't much more than for three months though so its worth considering the long term options. There appear to be offers available such as splitting a year's training over several visits making the deal even better value for money. Obviously you need to be sure before committing that this is where you want to develop your taichi. The training fee is for working with one of the school's senior teachers on a personal basis. Students can pay more for contact with Chen Bing when he is resident. Please contact the school for more details on fees. Nb. Chen Bing is not always in residence at the school. The quality of the senior teachers I saw looked really good, in fact I was really emotional watching one performance of Lao Jia; it was just beautiful, and presumably this aesthetic subtlety in the form reflects Chen Bing's style. Students I spoke to were very happy with their training although it was clear that more experienced students were able to take more from the training in a short period. As in every school the journey for a beginner is not easy. I can only suggest people train with a teacher in their own country for a while first before approaching Chenjiagou, but on the otherhand you may learn incorrectly and here you have access to superb teachers from day one. So this is a difficult judgement call. The only weakness I could see at the school when I visited was that although Chen Bing speaks reasonable English, none of the other teachers do, so having a translator present would be a useful addition to the school. Learning some Chinese before attending would be useful as with most of the schools. Please see About Chen Jia Gou. Please see Getting to Chen Jia Gou. 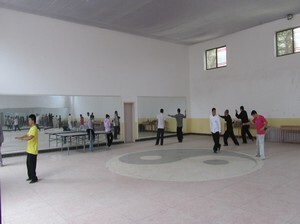 To summarise like the other Chen family schools in Chenjiagou, this is a complete Tai Chi training environment set up with a definite sense of responsibility and duty to ensure that Chen Style Tai Chi continues to flourish around the World in the future at the highest level possible. It will no doubt be an interesting environment for many international Tai Chi students to study at. The China Taichi Guide : An Introduction to Chen Bing's School, Chen Jia Gou. Chen Bing is a 20th Generation Chen Tai Chi Master and the nephew of Chen Xiao Wang. 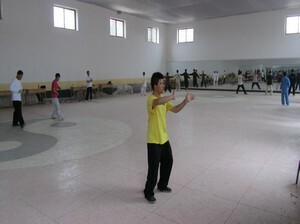 He now has a brand new school in Chen Jia Gou set up to provide Tai Chi training for international students.